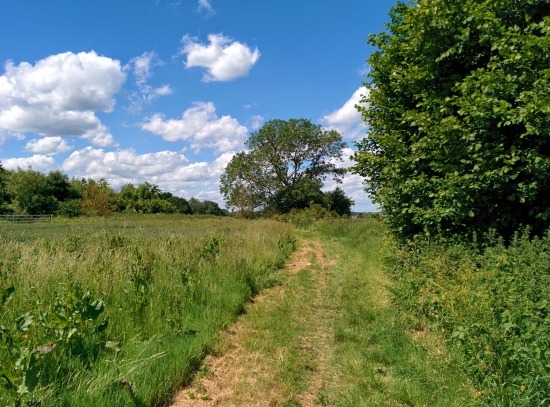 This walk is the first in this series north of the A414 and east of the A1 (M). 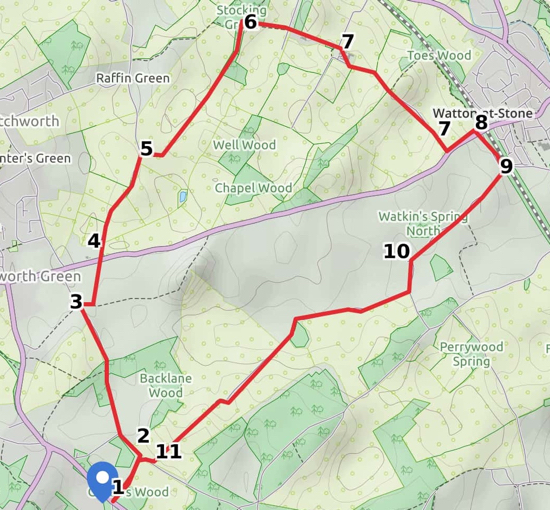 It doesn't actually feature a local pub along the route, however the Horns in Bull's Green is near enough to the start and finish of the walk and can be reached by taking a slight detour via Backlane Wood and Moathouse Farm. Parking is difficult, but there is a good spot for several cars at the junction of Bramfield Road and Queen Hoo Lane. Park at the start of the footpath on the north-east side of Bramfield Road next to Green's Wood. Walk through the wood until you reach a footpath T junction. Here you turn left and follow the path north and through Backlane Wood. After leaving the wood, continue heading north-west until you reach a footpath sign to your right. This point is a footpath crossroads, and you head east for a short distance before taking a footpath on your left and head north across a field. When the path reaches Watton Road, which is a Roman Road, cross the road and continue heading north-east along a bridleway. When you reach a clearing, look out for a path to your right heading east and then turning north-east. Follow this path, into another wood, Stocking Grove, and look out for a path on your right soon after a track leaves on your left. Take this path heading due east down a hill and then up the other side past Broom Hall Farm. Follow the track around the farm and over a few fields until you reach Watton Road again. This road can be busy, so instead of risking walking along the road, look out for a path on your left that runs along the north side of Watton Road heading east eventually emerging on Watton Road opposite Church Lane. Cross Watton Road and walk down Church Lane to the point where it turns left over a railway bridge. Here you turn right and follow a paved track past Watkin's Spring North and past Watkin's Hall Farm. You will pass two duck ponds on your right. Just past the last farm building take the right hand fork in the track and head slightly south-west following the path as it first bends left then right again and heads straight over several fields until it reaches Back Lane. Here you turn right then immediately left ending up where you parked the car.